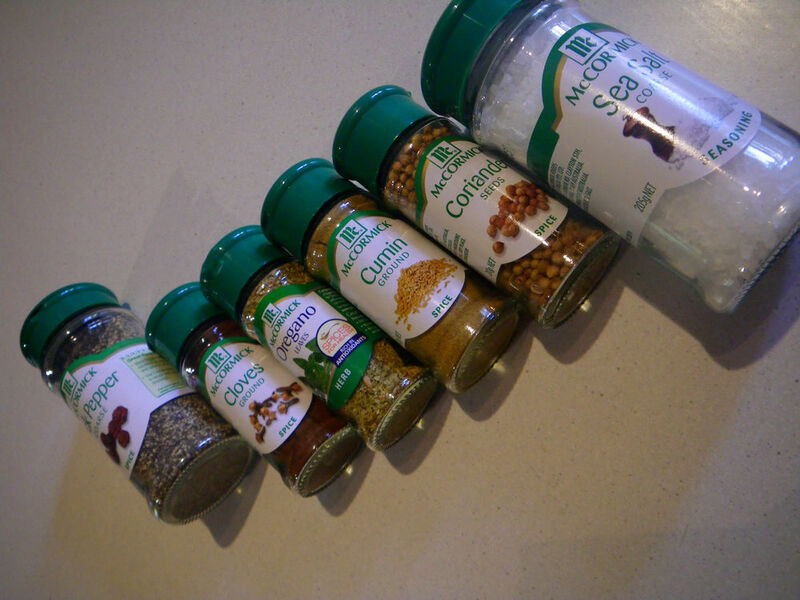 Disclaimer: The spices are supplied by McCormick Australia for me to participate in the Flavour Forecast 2014 Blogger Challenge. In 2014, the global leader in the flavour industry, McCormick celebrates its 125th anniversary. This year, they launched the special edition of Flavour Forecast, which contained 5 flavour trends to be popular in 2014, predicted by professionals in the food industry worldwide. These five flavour trends include chilli obsession, modern masala, clever compact cooking, Mexican world tour and charmed by Brazil. Each one of them are of a huge popularity across different continents. I was invited to participate in the Blogger Challenge to pick up one of these trends to create my own dish. 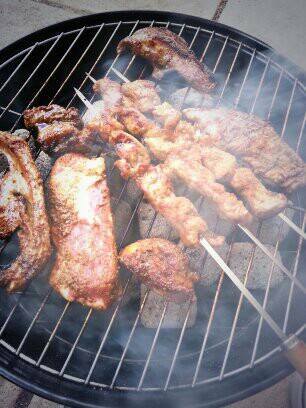 I decided to use the “Mexican World Tour” trend to create a beautifully tasting barbecue over the Easter break. 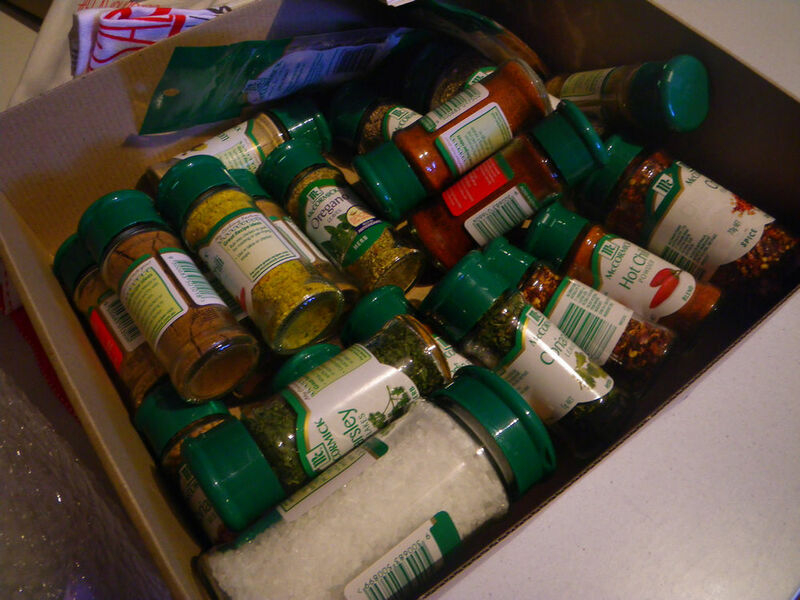 What really inspired me was the spices used in this trend and the complexity of the tastes of the spices. Mexican flavours have been long in history in North America and I am very glad to see the ancient flavours are shining in the 21st Century! The recipe I am using today was from Yucatan peninsula, however, I modified the original recipe a bit to fit the barbecue scenario better :D.
1. Cut the beef sirloin steaks into medium sized cubes. 2. 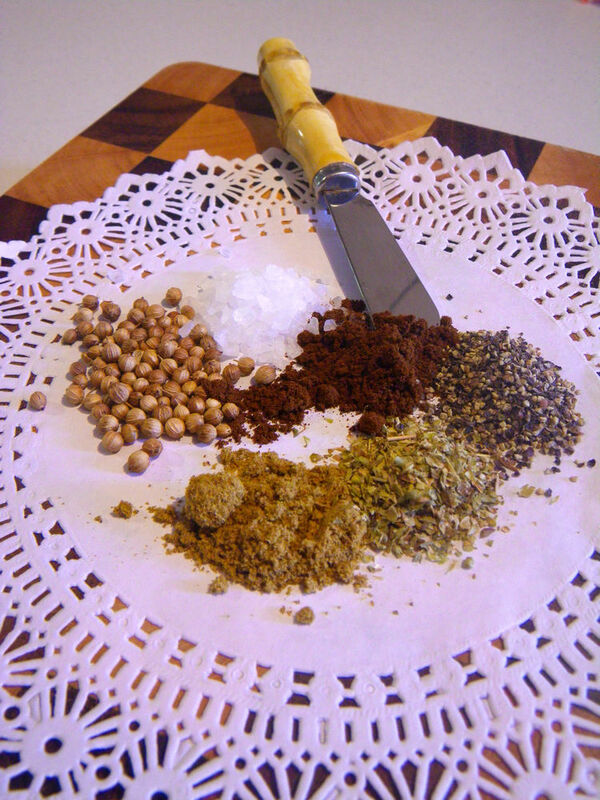 Blend the spices listed into fine powders and rub the meat cubes with the mix. Leave in the fridge for 3 hrs before barbecuing. 3. 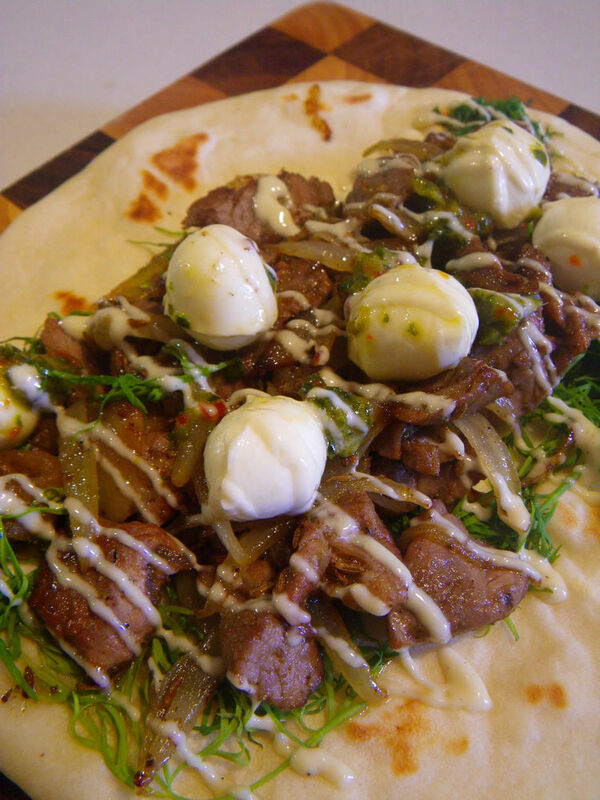 Put the marinated beef cubes on a kebab. Light the char grill and get smoky! 4. While the chargrilling process is on, mix the ingredients for the bread to make a dough. 5. Let the dough to raise to 1.5 times in size as the original and divide according to the size of your pan. Roll the dough into round shape with no more than 3 mm in thickness. 6. Place the individual dough in the pan on low heat with no oil. Cook one side until it gets slightly brown and some bubbles appear on the surface. Turn to the other side of the bread and cook the same way. Now, your bread is ready. 7. Once the meat is cooked through, spread another lot of the spices mix. Set the meat aside. 8. In the pan, cook sliced onion until brown. 9. 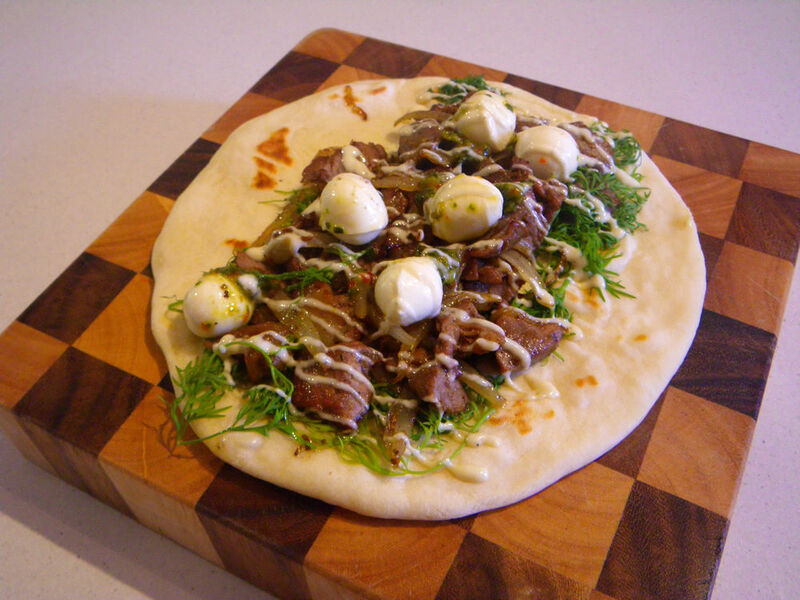 To assemble the dish, place the dill in the center of the bread, add the mixture of beef cubes and the cooked onion. Randomly add the cheese balls and top all these up with mayo. 10. Wrap it up and enjoy! Congratulations to the winners! An email will be send to you soon and please reply within 48 hrs. The prize will be redrawn if no response is received with 48 hrs of sending the email. I am really surprised with the addition of the bocconcini balls. I would think you might want to put the whole dish in the oven to get the cheese melting before serving, but lovely to read about the recipe. Melting them can be a good method too. I will try next time. 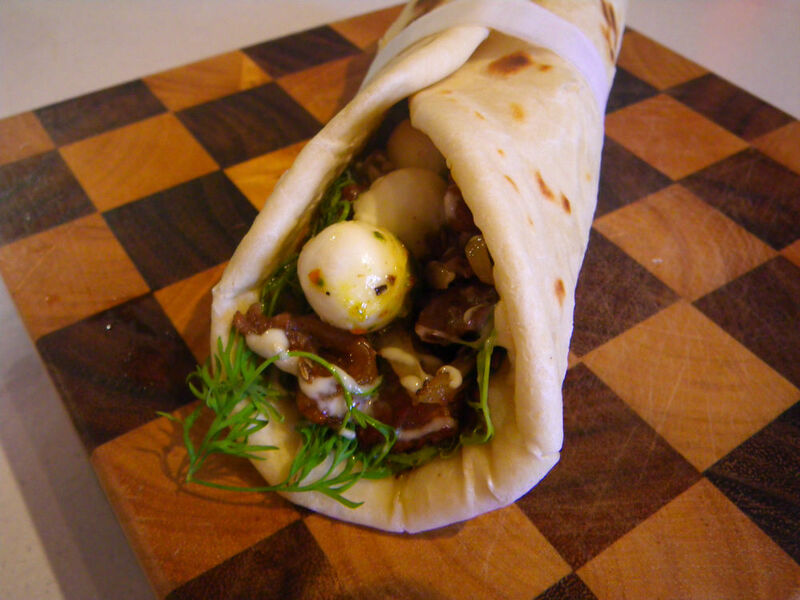 Best beef wrap ive seen 🙂 love it!